Yes! It's time for another temple! I do like to check out a temple now and then.. there are about 25 temples and shrines on this blog so far... so if you are a fan of religious architecture, or want to follow the temple trail, check my Phuket Temples section. 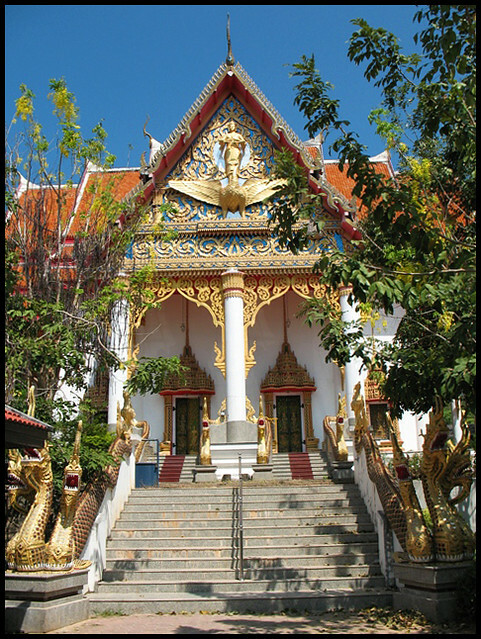 There are Buddhist temples all over Phuket, mixed in with Chinese shrines and lots of mosques and some churches too. 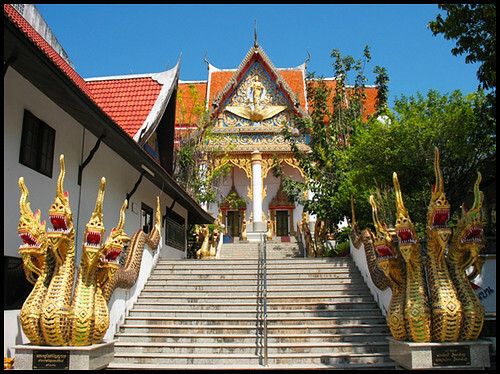 Wat Vichit Sangkaram, also called Wat Kuan, can be found just to the Northeast of old Phuket Town, near the government offices, the court, the prison and Satree Phuket school. 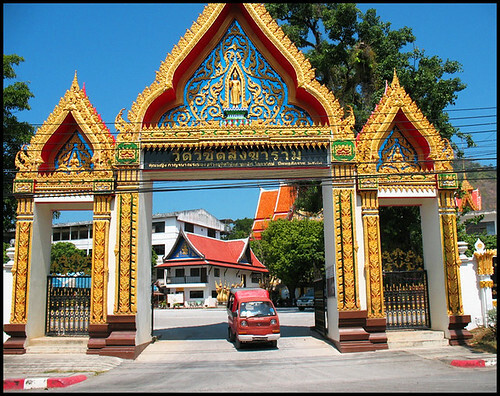 As with many temples around Phuket, there is very little on the internet about Wat Vichit Sangkaram. As of now, it's my weather blog that is No.1 in a Google search! I imagine this blog will be by tomorrow. 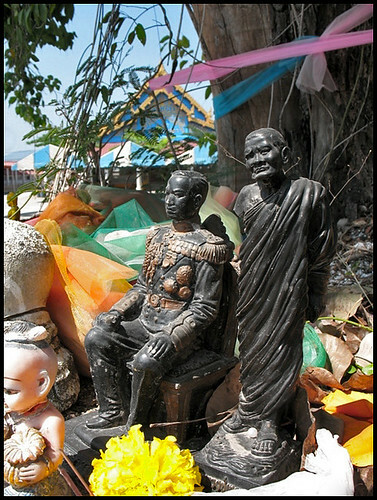 All I can find is that the temple has been used for funerals of some important local people, and last year was the site of a ceremony paying respects to Her Royal Highness Princess Galyani Vadhana. I forced a "temple stop" on the family some weeks ago. We had just eaten lunch at the Uptown restaurant which is nearby, and I could not resist the lure of an unblogged temple! So, I ran around and took a few photos. The temple grounds were being renovated, with backhoes and construction workers all around. Sure it will look better soon! 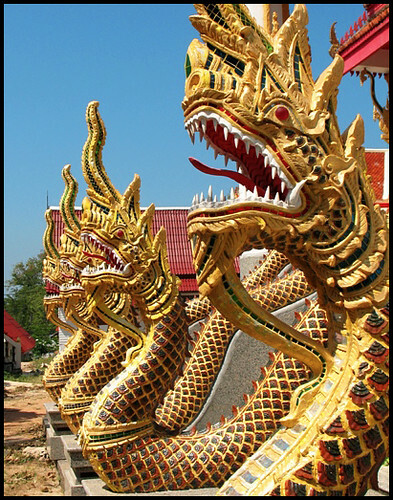 Naga (multiheaded snakes) guard the entrance to the temple. The Naga is a part of the Buddha story. 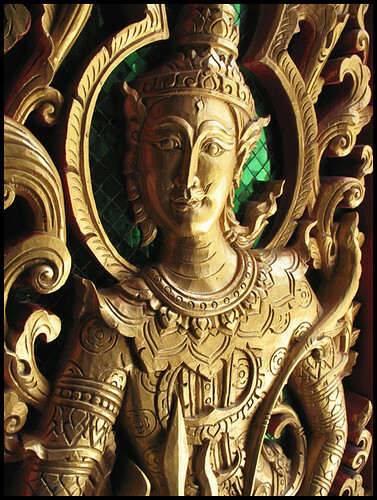 You often see Naga images above the head of the Buddha. In the story, the Naga raised it's multiple heads to protect Buddha from the rain as he meditated. (above) Naga outside Wat Vichit Sangkaram, and detail of one of the carved temple doors. I think, if you are passing by, any local temple in Phuket is worth a look. The detail and decoration is often impressive. There are a few temples such as Wat Chalong which get crowded with tourists and locals, so I do like to stop at the smaller, less well-known temples too. Much more to Phuket than beaches, you know!